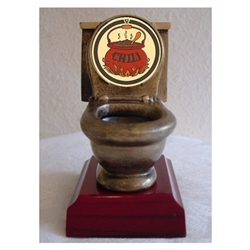 Chili Toilet Trophies. This makes the perfect award for the spiciest, hottest chili, or last place cook off award. NOW WITH NEW CHILI INSERT! Item as pictured measures 5". For added height, you can also add a 2" high black marble base or 4" high walnut wood base if you like.